Representative Ayanna Pressley at her last city council meeting on Dec. 5. It’s only been a couple weeks since Ayanna Pressley was sworn into office at the US House. And her successor, Althea Garrison, had barely settled into her seat on the City Council earlier this month before her colleague, Tim McCarthy, announced he wouldn’t seek another term. In the 2018 midterm elections, an array of underdogs — especially women and people of color — famously mounted a number of victorious campaigns for Congress. Back in Boston, political analysts predict that trend could continue in the city’s 2019 contests, when the 13 City Council seats stand to attract a host of new faces, many of whom are unafraid to challenge incumbents. 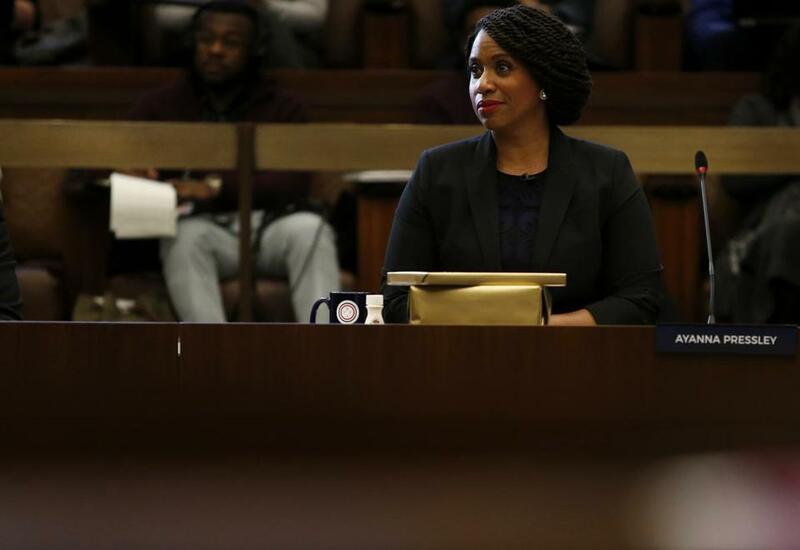 “I think one of the things that Ayanna showed people is you can dive in,” said Mo Cunningham, a political science professor at the University of Massachusetts Boston, of Pressley’s surprising upset over a 20-year incumbent in last year’s primary for the Seventh District. “I think a number of people are going to look at the established incumbents and say, ‘I think I can beat that person,’ ” he said. Several candidates have already expressed interest in the council’s four at-large seats. By city law, Garrison — who placed fifth in the last city election for those four seats — stepped in to replace Pressley when she left for Washington, D.C. Councilors serve two-year terms, and all four of those seats will be up in November. Garrison announced at her swearing-in that she’s seeking another term. But she’ll likely have a lot of company on the ballot. Candidates who have already announced at-large campaigns include Mission Hill native Alejandra St. Guillen, who until recently was director of the city’s Office of Immigrant Advancement. She announced she would run in early December — the same day that Pressley said goodbye to her councilors. David Halbert, deputy director of community affairs in the Middlesex sheriff’s office, said he’s in. So is Jeff Ross, a longtime community activist and attorney from the South End who ran unsuccessfully in 2013, saying he wants to address inequality in Boston. Other candidates for at-large seats include Amanda Smart of Brighton, who says she has worked for the Massachusetts Association for the Blind and Visually Impaired as well as the Brain Injury Association of Massachusetts; Taushawn C. Tinsley of Dorchester, a Boston public school educator and a former planner for the Mayor’s Office of Emergency Management; and Julia Mejia, a native of the Dominican Republic who lives in Mattapan and founded the volunteer group Determined Divas. “My drive to enter this race is born out of an urgency to lift the voices of those drowned out by political insiders who have dominated the conversation about the direction and future of our city,” said Mejia in a statement announcing her campaign last month. At-large seats are elected citywide, and the top four vote recipients make it to the council. In 2017, that was Pressley (22 percent) and Councilors Michelle Wu (24 percent), Michael Flaherty (19 percent), and Anissa Essaibi-George (17 percent). And although the job of councilor pays nearly $100,000, the races are rarely competitive unless the incumbent has announced they’re leaving. For example, in the past two municipal elections, the at-large council races have failed to attract the requisite nine candidates to trigger a preliminary election. In 2017, Mark Ciommo in District 9 was the sole incumbent whose race drew enough interest — two challengers — to face a preliminary contest in his district. But several candidates ran for each of the three open seats on the council in 2017. The election of Lydia Edwards and Kim Janey in two of those districts, Districts 1 and 7 respectively, prompted historic change in the makeup of the council, which now has a record six women of color serving there. “I don’t think we’ve seen the end of it, I think it’s only going to grow,” said Laura Martinelli, executive director of the Massachusetts Women’s Political Caucus, of the growing number of women who have expressed interest in public office following President Trump’s election in 2016 and the first Women’s March. She said she sees that trend carrying over into the municipal elections, noting that women politicians often began their political careers at the local level, for school committees or city councils. “It’s often how women get engaged and dip their toes into politics,” she said, pointing to Pressley and state Senate President Karen Spilka, who launched her career after serving on the Ashland School Committee. Meanwhile, other candidates have their eyes set on the district council seats. Ricardo Arroyo, a lawyer whose brother and father have previously served on the council, announced his candidacy for the Fifth district, which includes Mattapan and Hyde Park, in December — well before the incumbent, McCarthy, announced he wouldn’t run. Jean Claude Sanon of Mattapan, who previously challenged McCarthy, said he will run again, and the Bay State Banner reported that Yves Mary Jean of Roslindale is also in. In District 8, which runs from the Back Bay to Mission Hill, Hélène Vincent announced she will challenge incumbent Councilor Josh Zakim. She is the director of research and academic partnerships at EF Education, according to her website. Kristen Mobilia, a community organizer who also challenged Zakim in the last election, winning 32 percent to 67 percent for Zakim, said she will run again. And Lee Nave Jr., a community engagement officer for Citizens for Juvenile Justice, announced that he will challenge Ciommo, who has represented Allston and Brighton in District 9 since 2007. Peter Ubertaccio, a dean and political science professor at Stonehill College who follows Boston and state government, said he expects others will come out in spades by the April filing date. He added that Pressley’s win could not only encourage potential candidates but embolden established incumbents who want to cement their political legacy, and even use their own success on the council — and in the upcoming city elections — as a launching pad to other offices in future elections. “It’s pretty rare to see someone holding a political office who isn’t thinking about the next election,” he said.